MPPGCL Lab Technician Recruitment: Madhya Pradesh Power Generating Company Limited (MPPGCL) has officially published online notifications regarding MPPGCL Lab Technician Recruitment for recruiting skilled & passionate candidates. Therefore, aspirants who are aiming to secure Govt Jobs in Madhya Pradesh can utilize this excellent opportunity. Currently, there are only 02 vacancies available for the MPPGCL Lab Technician Recruitment 2019. Therefore, this the competition is so high, candidates must prepare very well for the MPPGCL Lab Technician Examination. Candidates can start submitting the online applications from 15th March 2019 & the last date for submitting the MPPGCL Lab Technician Online Application is 14th April 2019. MPPGCL Recruitment Board has released notifications regarding Madhya Pradesh Lab Technician Notifications & also MPPGCL Lab Technician Vacancies. Therefore, those who are seeking Govt Jobs in Madhya Pradesh can go through the MPPGCL Exam Syllabus & Exam Pattern on our website. Aspirants looking to apply online for the MPPGCL Lab Technician must first be eligible for the post. Therefore, check out the details regarding Eligibility Criteria, Age Limit, Selection Procedure, Application Fees, etc. in the below sections of this article. Also, for more details, kindly visit the official website. Minimum 12th passed & Diploma/Degree from any recognized board/institution. Age Limit 18 -45 years. MPPGCL Recruitment Board will follow the selection procedure given below to recruit the candidates. The pay scale ranges from Rs. 25,300 -Rs. 80,500. Step 1 – First, visit the official website. Step 2 – Next, find the MPPGCL Lab Technician notification link, then click on “Apply Online”. Step 3 – Read all the instructions carefully & check your Eligibility & Age Limit. Step 4 – Enter all the details correctly & also upload the scanned copy of the necessary documents. Step 5 – Recheck all the details once again & complete the payment of application fees. Step 6 – Finally for future use, take a print out of the submitted application form. 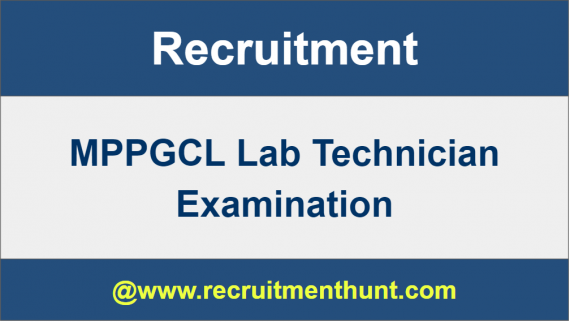 Finally, all the candidates can check the MPPGCL Lab Technician Recruitment Notifications here. Hence, applicants can furthermore, make their preparation easier by following the MPPGCL Lab Technician Previous Years Question Paper. Therefore, download MPPGCL Exam Patterns in addition to the MPPGCL Lab Technician Previous Years Question Paper 2019 on this article. Also, for more State and Central Government job updates do subscribe to our site Recruitment Hunt.